We are praising God for working in a mighty way over the past several days! Our special speakers, Pastor Brent and Shelli Armstrong, from Tucson Baptist Temple, were supposed to arrive Wednesday morning. We had planned for them to share their testimonies with our church people on Wednesday night during the mid-week service. However, they were delayed by 24 hours due to a mechanical failure with their plane. Everyone showed up on Wednesday evening expecting to get to meet our special speaker, but God had other plans! James explained what had happened and then asked that we all just pray, one by one, for the conference. As a church body we literally cried out to God, begging Him to work in our hearts through the preaching of His Word and for souls to be saved. After an hour and a half we had to quit because it was getting late, but those who didn’t have young children probably could have stayed for at least another hour. Why are YOU Having a Missions Conference? Several folks have asked why a church plant in a foreign field would have a missions conference. That’s a good question. The Great Commission in Matthew 28:18-20 is given to EVERY believer, not just those in the USA. However, the focus of this conference was a bit different than the average missions conference in the States. The focus here was mostly on answering God’s call to serve Him full-time rather than supporting missionaries (but we’ll get to that soon!). God answered prayer and greatly worked through the preaching. One couple approached us after the first night saying, “We’re willing to do whatever God wants us to…where do we start?” Amen! There was a good turn-out among the members at the meetings Friday through Sunday. On Friday afternoon we had an evangelistic ladies meeting. There were 10 visitors, one of whom trusted Christ! She is already scheduled to begin Basics for Believers with one our members. On Saturday afternoon we had a men’s cook-out. There were at least 6 men visiting, one of whom was one of our neighbors! On Monday evening we held a Business Ethics seminar. Because Pastor Armstrong was a successful businessman before going into the ministry, we wanted to use that as an outreach tool. It was advertised on the radio and open to the community, so honestly, we had no idea if there would be 5 or 50 people there. Actually, there were over 30 adults! The response was phenomenal. People were blown away by the concepts and Biblical principles presented. This family brought a total of 11 first-time visitors during the week! Please pray for us as we follow up on those who need a visit. We are so thankful for the ministry of Pastor and Shelli. 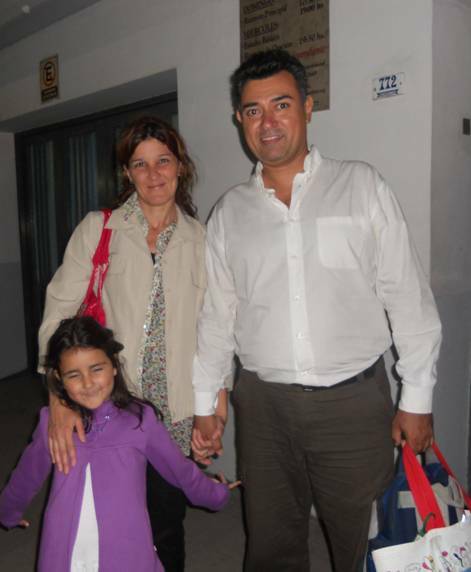 They were a tremendous encouragement to us personally and in the ministry. They were a blessing to our church folks in their speaking and with their examples. 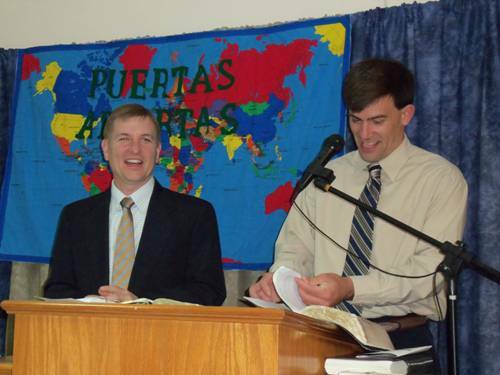 We thank God for the work He did through their visit to Argentina. (You can read their summary of their trip here.) Thank you to the folks at TBT for lending us your pastor and pastor’s wife for a week! We look forward to reporting more of the fruit of this trip in the near future! 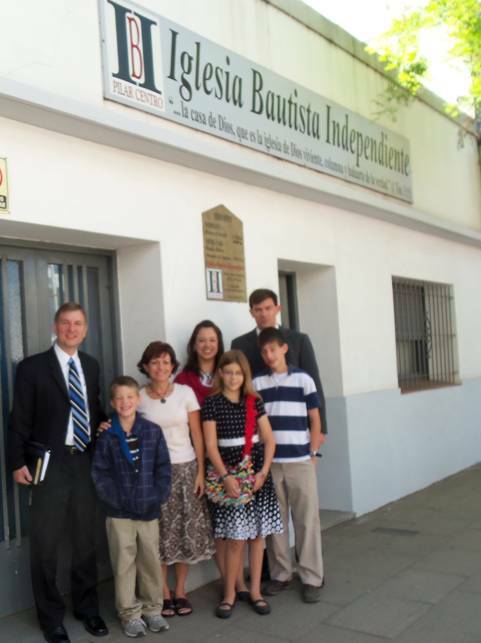 This entry was posted in evangelism, mission teams, praise, update and tagged Pastor Brent Armstrong by IBI Pilar. Bookmark the permalink. Beautiful family! Beautiful ministry! Beautiful Lord and Savior!